I’ll tell you about the origin of this mysterious title in a bit, but first let’s try to briefly paint a picture of this great man of the Orthodox Church. St. Gregory was one of the most gifted people of his time. Brilliantly educated, the future Roman primate even once worked as the head of the city administration of the “eternal city.” Admittedly, it was a special time—the Middle Ages. Even Protestants revere St. Gregory as “the last good pope.” Sleeves rolled up, he strenuously worked for the good of the Church, the state, and the people, with the help of God. He was not just an ascetic, not just a writer, not just a church organizer, but also a politician, having great influence on the Roman Empire and its affairs in the world. As for writing, to the quill of St. Gregory the Great (as Catholics call him) belong many compositions which are still read and still useful, and interesting. He is even the author of one Medieval Christian bestseller—a book full of miraculous stories and didactic cases, known as Conversations on the Lives of the Italian Fathers and on the Immortality of the Soul, or, The Dialogues for short. Here is the key to his mysterious name. By the way, in The Spiritual Meadow, St. Gregory the Great is mentioned. There is no room to quote this story here—look for it yourself, if not in long-form in The Spiritual Meadow, then in short in the life of St. Gregory the Dialogist written by St. Dmitry of Rostov. Let us finish the story about the holy miracle he performed at Liturgy. The story needs no commentary. The only thing is to remember it over the weekend, when with hands crossed over our chest, by the grace of God, we will approach the Chalice of Christ. So, let’s listen. “The saint, seeing her disbelief, prayed to God, and immediately the bread turned into real human flesh in appearance. And not only did this woman see this bloody human flesh, but everyone present in the church; everyone, seeing this miracle, glorified Christ God and was further established in the faith, not doubting at all that in the Most Pure Mysteries, under the appearance of bread, is distributed the real Body of Christ, and under the appearance of wine, His true Blood. Afterwards, the saint again prayed, and the appearance of the human body turned again into bread. Then this woman communed with great fear and firm faith, receiving the bread as the Body of Christ, and the wine as the Blood of Christ. Wisely governing the Church, Hierarch Gregory tirelessly planted the Word of God. 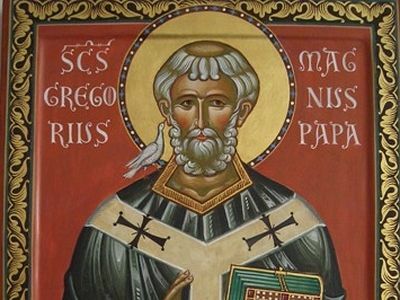 Saint Gregory compiled in the Latin tongue the order of the Liturgy of the Presanctified Gifts (used during Great Lent), which before him was known only in oral tradition. This is awesome. Would it be too weird to add footnotes about where these books could be purchased?